The “nuclear enterprise” – as the nuclear weapons complex and force structure in the United States have been successfully rebranded — is bloated and in need of paring. It is also in need of repair. The Pentagon commissioned two high-level studies to clarify particulars and remedies. Repair work on an aging command and control infrastructure and a broken security culture is not optional. Supporters of the nuclear enterprise also seek far larger expenditures to recapitalize all three legs of the Triad. Whatever sums are spent on strategic modernization programs will not reduce threats unless the United States also repairs and modernizes non-military means of threat reduction. Investing in one without the other is a poor investment strategy. Nuclear weapons deter threats in kind; they don’t reduce them. Deterrence without diplomacy is downright dangerous. The diplomatic threat reduction enterprise consists of the men, women and institutions, domestic and international, dedicated to reducing threats posed by dangerous weapons. The primary locus of non-military threat reduction in the United States is the State Department, but other agencies provide crucial technical and analytical support. The Arms Control and Disarmament Agency used to be dedicated to this mission, but it was folded into the State Department in 1997 to facilitate the Senate’s consent to ratify the Chemical Weapons Convention. 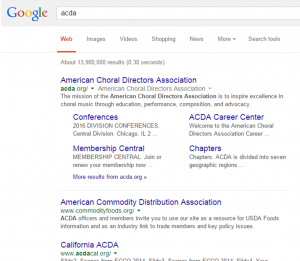 If you google ACDA now, the first entry that pops up is the American Choral Directors Association. The arms control brand, which made a splash in the 1960s, has come upon hard times. The arms control brand still evokes images of formal negotiations where progress is counted in numbers. A decade ago, I argued (in Cooperative Threat Reduction, Missile Defense and the Nuclear Future) for the rebranding of “arms control” as “threat reduction” – with apologies to this website and the Arms Control Association. My reasoning: arms control has expanded well beyond formal negotiations to encompass collaborative laboratory initiatives to improve nuclear security, checkpoints at border crossings, sleuthing for illicit transfers of radiological material, the creation of centers of excellence to improve personnel training, mine demilitarization efforts, greater transparency in arms transfers, improved monitoring for very low-yield underground testing, the development of codes of responsible conduct, and dozens of other activities. The merger of ACDA and State has not been kind to the WMD threat reduction mission, which has suffered from insufficiently funded mandates, poor personnel management, and the absence of mechanisms and slots to recruit new talent. The seventh floor of the State Department is fighting so many fires that it has neglected basic housekeeping needs. The person whose job it is to attend to those needs has been awaiting confirmation for over 500 days. (As this is written, Frank Rose finally appears set for a confirmation vote.) Unlike the nuclear enterprise, the non-military threat reduction enterprise has no powerful constituency to demand budget redress or ameliorative steps. Supporters of arms control have not horse-traded very well on Capitol Hill. The State Department’s personnel practices have failed to maintain a work force commensurate to the tasks of threat reduction in the 21st Century. Foreign Service Officers rotate in and out of trouble spots, while civil servants, who work on threat reduction all the time, don’t spend enough time in trouble spots. Half of them are nearing retirement age. Unlike the Pentagon and the U.S. intelligence community, the State Department has few ways to bring in new talent with skill sets related to regional security and proliferation. Despite personnel and funding constraints, great progress has been made by employing non-military means of threat reduction. The biggest achievements in reducing strategic forces and nuclear stockpiles occurred right before and soon after the Soviet Union dissolved. More recent successes have not received their due. Partial achievements – like the eight-year moratorium of plutonium production in North Korea, or constraints on Iran’s uranium enrichment programs – are derided as failures, even though these results compare favorably to the costs of attempting to reduce WMD threats by military means. The Organization for the Prohibition of Chemical Weapons spent $87 million to demilitarize most, but not all, of Bashir al-Assad’s arsenal of chemical weapons. This price tag is equivalent to ten days of air strikes in Syria and Iraq against Islamic State targets. The United Nations spent less than $20 million per year from 1991 to 2007 to help prevent Saddam Hussein from reconstituting his stocks of chemical and biological weapons. It cost the United States over a trillion dollars, on top of incalculable human costs, to confirm what UN monitors were figuring out. For roughly $15 million per year, the International Atomic Energy Agency has monitored the down-blending of enriched uranium in Iran and constraints on operating advanced centrifuge designs while keeping a close watch on declared facilities to provide early warning of breakout. No one can confidently estimate the costs, monetary and otherwise, of a military campaign to improve on these results. We don’t know what additional public health and nonproliferation benefits might accrue from the Biological Weapons Convention if it were allowed a Secretariat of more than one person. The United States spends less than $30 million per year to support the Comprehensive Test Ban Treaty Organization’s international monitoring system and Secretariat. These costs are not trivial, but they fade in comparison to the costs of another competitive round of nuclear testing. By definition, all cases of diplomatic engagement relating to weapons of mass destruction are hard and failure can be extremely costly. The exact same calculus applies to the use of force. As with military campaigns, diplomacy doesn’t always succeed in reducing threats. Vladimir Putin, for example, isn’t ready to negotiate deeper reductions in deployed strategic forces. In other cases, such as North Korea and South Asia, Washington hasn’t really tried sustained or meaningful diplomatic engagement to reduce nuclear dangers. Most of the time, progress comes after years of effort. Beijing is only now beginning to engage more fully on cooperative threat reduction. If the use of force is to be a last resort in hard cases, then investing in non-military means of threat reduction is a matter of simple prudence. The non-military threat reduction enterprise, like the nuclear enterprise, is in need of repair. The State Department would be wise to follow the Pentagon’s example by convening a blue-ribbon commission to clarify shortcomings and remedies. Documenting the ugly particulars of how capabilities for diplomatic means of threat reduction have been degraded is a precondition for renewal. What is the extent of understaffing, mal-deployment and under-resourcing, and how might these be improved? Clarifying these deficiencies will come to naught unless sympathetic Members of Congress are as tenacious in fighting for remedies as supporters of the nuclear enterprise. Otherwise, threats will grow regardless of how much is invested in strategic modernization programs. Frank Rose was conformed by the Senate on Tuesday after an epic 516-day wait. make that confirmed. altho conformed might also work. MK: Very well said and argued. Do not disagree. The multiple approaches to keeping boundaries on WMD deployments, including transparency and limits, as well as prohibitions, are not inconsistent with deterrence and maintaining credible and stabilizing forces. But those favoring the more diplomatic approach have tended to not only criticize the maintenance of American deterrence but seek the significant diminution of such American deterrence–blaming it for others proliferation— without recognition that the bad guys get to vote, too! IAEA did not stop any of the proliferation, nuke program or actual nuke modernization we now worry about–Iran, Libya, North Korea, China, Russia, or Pakistan. In fact Blitz and El Baradei went out of their way to belittle the prospects of nuclear weapons in some of these countries. But during the past 20+ years we have neglected our deterrent as well as deterrent doctrine while implementing START I, the Moscow Treaty and New Start, reducing nuclear deployments from in excess of 26,000 US and Russian strategic warheads to roughly a combined 3000. So arms control we certainly have had, big time. Deterrent modernization we have not. A better balance is necessary but I believe the push for zero gets in the way as it sets us up for the Ted Turner fortune cookie analysis: If the US has a few thousand nuclear weapons why cannot Iran have a few hundred! If the stereotyped peaceniks were in charge, the State Department and other elements of the “Diplomatic Threat Reduction Enterprise” would be well funded indeed. The FY 2015 budget request was $46.2 billion for State and $495.6 billion for Defense. By my reckoning, that’s nearly an eleven-to-one advantage for Defense over State, even under the global-zero (but not in my lifetime) Obama vision. Russia is the only nuclear peer to the U.S. China is a distant second. I don’t know any responsible nuclear arms controller who thinks Iran and North Korea should have nuclear weapons, let alone hundreds of them. With over a thousand nuclear weapons, the U.S. can continue to deter anyone who can be deterred. The problem is that deterrence will someday fail; when that happens, it would be better if only a few or no nuclear weapons were still left in the world. As I see it, in part, you want to make a cost-benefit argument that insufficient funds are spent on nuclear diplomacy relative to nuclear weaponry. Some brave souls at the Stimson Center (and elsewhere) have done detailed research and analyses of the nuclear weapons budgets. Perhaps similar budget analyses (and comparisons) can be made for the nuclear arms control and other non-military nuclear threat reduction activities. Lim Jong-in of Korea University said, “It seems that North Korea is behind the hacking of the reactors. The way the attacks were carried out is highly similar to previous attacks on KBS and Nonghyup banks in March last year” in which the North has also been fingered.